The Philips SatinShave Prestige electric shaver is a shaver that is fully of versatility. With around a $55 price, it is at a medium price point compared to other shavers, and it’s worth the money. 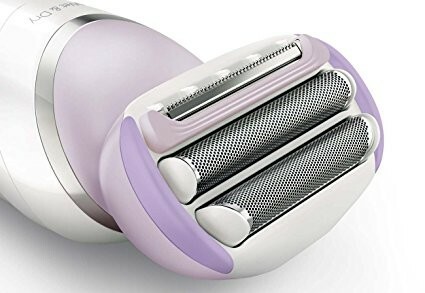 For one thing, this razor has 5 accessories for your different needs such as a bikini trimmer head that will help you with virtually painless hair removal. The shaver also includes an efficiency cap that helps you with less painful hair removal as well. This shaver is made with comfort in mind. It includes 5 accessories for versatility. It includes an efficiency cap for less painful hair removal. It features pearl-tip trimmers that protect sensitive skin from serious irritation. It can be used wet or dry. It includes soft-touch comfort cushions that provide a smooth touch while shaving. The foils follow the contours of your body for a closer shave. The bikini trimmer of the shaver doesn’t provide less painful hair removal. Some customers say it’s hard to use. The shaver doesn’t shave legs closely. Some customers say it should only be used as a trimmer. It is water-resistant, not waterproof like some electric shavers. The battery doesn’t last as long as some other electric shavers might. It provides a 1 hour use after an 8 hour charge. 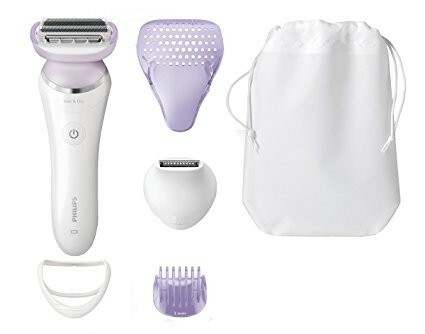 Because of all the factors stated above, this shaver is a good price for the money. The SatinShave Prestige electric shaver is aimed for comfort, and that’s important in finding the right shaver. Remember to use it as efficiently as possible, and use the tools included in the kit. Be careful with the bikini trimmer, as it might be harder to use than other parts of the shaver. Overall, it’s a good product with exceptional features. This could be the best women's shaver combo out there if it actually worked a bit better in removing hair! Many do find it a decent unit but prepare to be underwhelmed.